This is the proposed map of the BID area as of January 2017. This isn’t the finalised area and the steering group would welcome your feedback. It seems to me that as De Montfort University is right on the edge of this map, it might be worth including them in the BID process. The site of the campus has a major influence on the city centre in terms of footfall and trade. It is also the link between the city centre and the West End. For the same reasons, I would also extend the map toward Leicester University and include De Montfort Hall as well. The DMU aspect is interesting and something that is being considered. The University of Leicester and De Montfort Hall are slightly more difficult to include. The Industry Criteria states “the BID should encompass a tight geographical area” and as we’d have to extend the area up New Walk that might be difficult to incorporate. 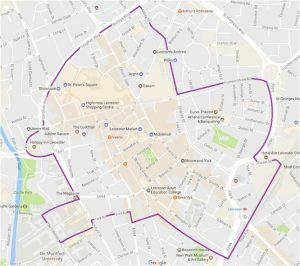 However, BID Leicester will be looking to have an Associate Member Scheme whereby businesses outside the core area can make voluntary contributions to be included in BID initiatives. I am surprised that you have not gone out to the inner ring road, so it includes areas like Frog island? As there will be a lot of new businesses wanting to move and invest in this area? Hi Ann, we’re looking at focusing the BID within tight geographical area. There is nothing to stop Frog Island, Narborough Road, Allendale Road/Francis Street etc. establishing their own BIDs over time. In keeping the area fairly tight it will give the best chance that businesses within the area will have similar priorities and therefore the potential BID fund is spend as efficiently as possible.